GeekBuying sent me a sample of their Tronsmart Draco AW80 mini PC powered by Allwinner A80 octa core processor. I’ve received the Meta version with 2GB RAM, and 16GB eMMC, but next month Telos version will ship with 4GB RAM and 32GB eMMC instead. Today I’ll show some pictures of the product and the internal boards, and in a few days I’ll write a full version with the Android 4.4 firmware. Later, I’ll most certainly review the Ubuntu beta image that’s scheduled for released by the end of the month. I’ve received the device by DHL in the black and gold package below. I was surprised by the size of the box (16.4 x 16.4 cm) which quite larger than what I’m used to with other TV boxes, and all cables and accessories are stored in little black boxes within the main package. 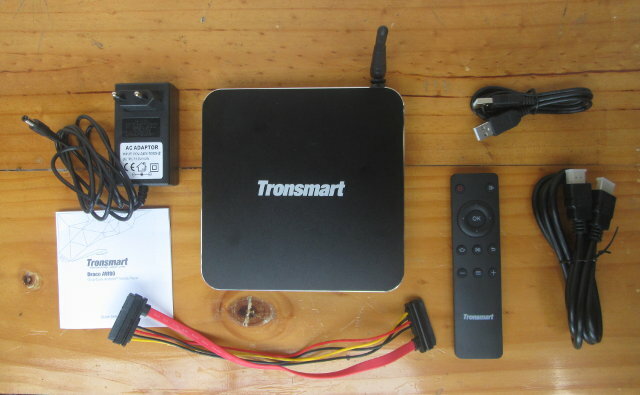 Accessories include a 12V/2A power adapter, a SATA cable, an HDMI cable, a USB 2.0 cable, an IR remote control requiring two AAA batteries (not included), and a quick start guide in English. A small rounded window for the IR receiver, and a through hole for a bi-color LED can be seen on the front panel. One one side, we’ve for two USB 2.0 host ports, an SD card slot, and a SATA connector. The rear panel features the Wi-Fi antenna, an RJ45 port for Gigabit Ethernet, a USB 3.0 OTG port (full size), HDMI and AV outputs, optical S/PDIF, and the 12V DC power barrel. There’s also a “Fn” through hole on the bottom of the metallic enclosure, most probably for firmware update. 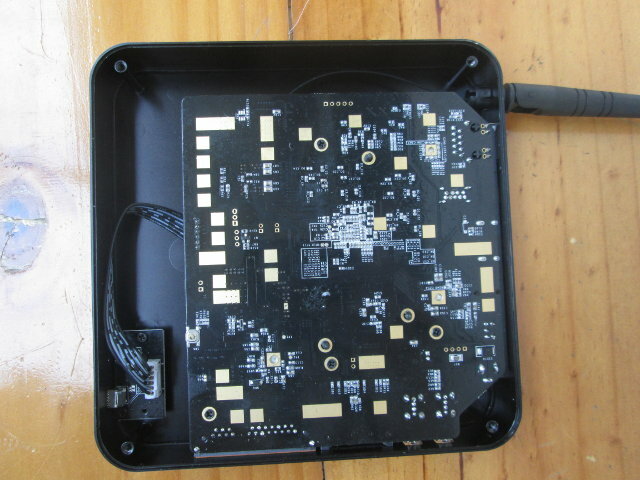 In order to open the enclosure, I had to take out the four sticky rubber pads on the bottom, and untighten four screws. The base of the case would not come out, so I pulled it with a precision screwdriver using one of the many ventilation hole on the bottom of the enclosure. There’s a tiny board connected to the mainboard for the IR receiver and a Blue/Red LED. Nothing much to noticed on the mainboard except SW6 switch which should be to access U-boot / FEL mode for firmware update. Four more screws need to be removed to take out the board from the case. 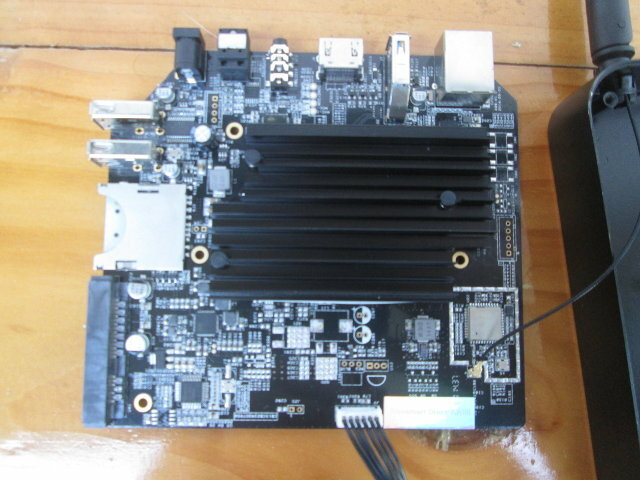 There’s a massive heatsink, and it indeed looks exactly like the board used in Zero Devices Alice Z8C. I’ve popped out three bits with spring to take out the heatsink. There a thermal rubber pad between the heatsink and the SoC/RAM/eMMC, no thermal paste. 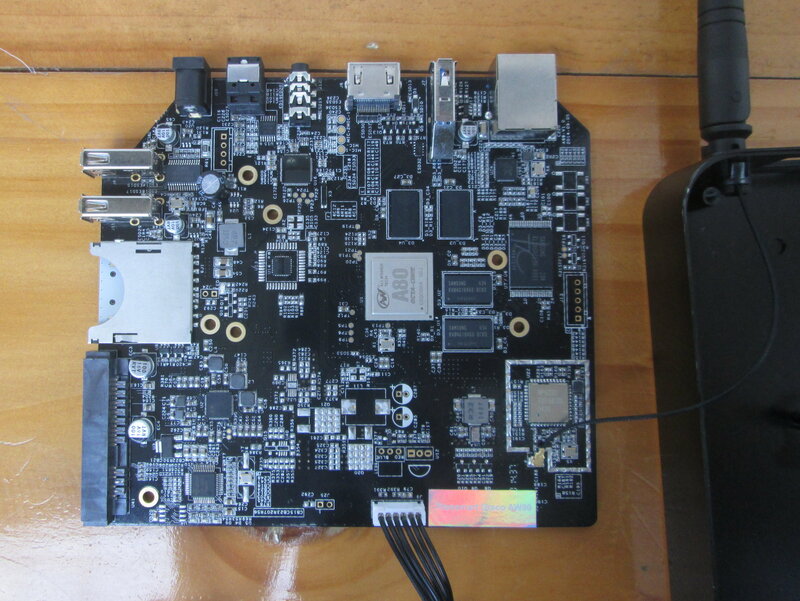 There’s a shiny sticker reading “Tronsmart Draco AW80” on the board to hide the actual board name. The Wi-Fi / Bluetooth module is AP6335 which means dual band Wi-Fi 802.11 n/g/n and 802.11ac should be supported together with Bluetooth 4.0. Four Samsung K4B4G1646D 16-bit DDR3 chips are used to get 2GB RAM, and the eMMC is model Samsung KLMAG4FE3B-0001 moviNAND (eMMC v 4.41) with maximum sequential write speed of 60MB/s, and sequential read speed of 150MB/s. Other ICs include AC100 audio codec, and Realtek Gigabit transceiver. There’s part of the board that unpopulated, but I’m not sure what it was meant for, expect for the LED and IR parts. The UART pins for serial console can be found right below the DC jack and S/PDIF connector. 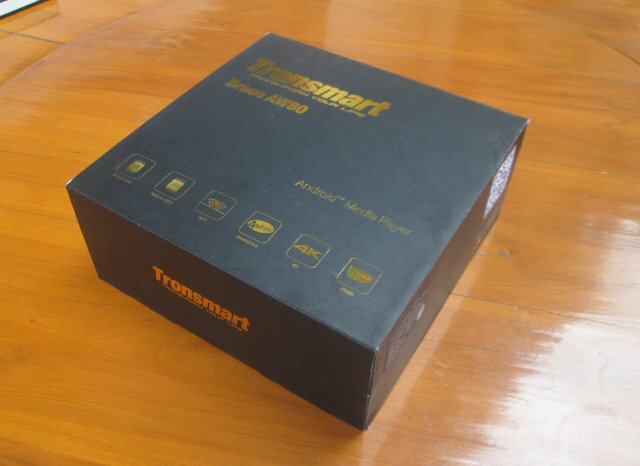 Tronsmart Draco AW80 Meta pictured in this post sells for $149 on GeekBuying, whereas the upcoming Draco AW80 Telos with 4GB RAM and 32GB flash is available for pre-order for $199, and should ship by the end of the month. You can also purchase either model on Aliexpress. VPU and GPU hw accel in Linux? Verry interesting..amazing devices:fastest wifi, 50k antutu, cpu no heat isues like rockchip,amlogic. Preview freaktab http://www.freaktab.com/showthread.php?19153-I-got-my-Draco-AW80-today! GPU is Imagination : no GPU support in linux. VPU has not 265/HEVC capability …. are you kidding? preview like a very best PR superfast and cool product…. Fineless is admin so I don’t think he PR for Tronsmart. And just waiting for full review CNX. Cnxsoft could you do a post with a comparison of recent tv boxes (rk3288, allwinner etc) showing different features and any that have hw support linux? thanks. Ugh, again my pet peeve of cheap and awful power supplies raises its ugly head… Please someone update their 90’s wall warts into 10’s tech, pretty please? Unpopulated parts are just for onboard IR and Red/Blue LED drivers and diodes, for other case models. Are you guy Happy for the Hardware or what the device can do? So far none of them have Linux support with accelerated 2D/3D graphics, and hardware video decoding. Not sure about the HIMEDIA (HiSilicon) platform. For 4K/H.265, you may want Amlogic S812 (not tested yet), or Rockchip RK3288. Real output will be 1080p, not 4K however, at least for Rockchip. Not 100% sure about S812 yet. AW80 can’t handle 4K/H.265 based on my tests. Will this AW80 supports both android and ubuntu ? do you prefer AW80 or Ugoos UT3 4Gb 32g ? The problem is that all boxes have flaws, so it depends which one matters to you. AW80 has working Gigabit Ethernet, but games may be a problem (or it’s only a recurring bug with Riptide GP2), and HEVC is not supported. HPH NT-V6 supports H.265 somewhat, has a faster eMMC, but Wi-Fi may be unstable (although when it works it’s very fast), and both Fast and Gigabit Ethernet did not work very well for me. Performance wise RK3288 and A80 feel the same, and even I would say there’s not much difference with S802, unless you play games.